The hotel has 15 comfortable rooms all of which are easily accessible, situated on the ground floor and those on the upper floors are serviced by a lift. All rooms are equipped to guarantee our guests the utmost comfort, complete with heating, LCD TV, hairdryer, telephone, Wi-Fi, courtesy kit, and bath towels. Most rooms have refrigerators, and some are equipped with balcony, and a window in the bathroom. We have rooms available equipped to accomodate guests with special needs. 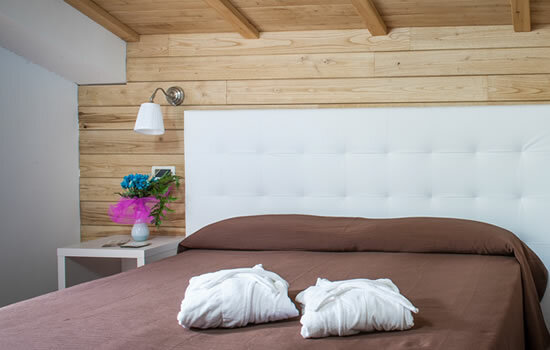 Furnished in our “Mountain Style” in wood with a white leather headboard. Modern bathroom. Superior rooms are equipped with a fridge. Decorated in a contemporary style, simple and spacious, with a classic bathroom, very bright and airy. Decorated in a contemporary style, with large bathroom and balcony. No soundproofing.